I must admit that over the years of being married, I have definitely improved my cooking and variety of recipes! At the beginning of our marriage, I DREADED cooking a meal or having the patience to cook something delicious and nutritious for my husband. Now that our family has expanded to two children, I really enjoy making a delicious meal that is also NUTRITIOUS and organic whenever possible. There is no prouder moment for me than when I see my family devouring my supper and saying how delicious it is! So what has changed over the years? Well, it is definitely the recipe books I use that have changed and helped me make better, tastier meals! I think it is so important to have a great go-to recipe book that can help inspire a great meal idea and guide you through it! That is why I always give cookbooks as wedding gifts because I think it is essential in every household!! One of the newest cookbooks gracing my kitchen and inspiring great meals and desserts is the Taste of Home Best Loved Recipes, possibly the last cookbook you'll need for a while because it has over 1,400 recipes in it! This hard-bound collection commemorates 20 years of the best submitted recipes! It's filled with mouth-watering favorites that will be sure to bring families together again for a new experience at the dinner table, and to enjoy a weekly meal, a special holiday or occasion. Life is a collection of moments and Taste of Home is all about making those moments special and memorable. Each recipe has a very personal story of what it has meant to those who submitted it and their families. You'll find Saturday night appetizers, weeknight dinners, secret family recipes, potluck favorites and so much more! Chapters also include some of the most cherished magazine features including: Mom Made it Best, Our Favorite Contributor's Meals, Mealtime Express, Cooking for One or Two, Grand Prize Winners, and more. Each recipe has been evaluated and selected by the Taste of Home test kitchen as the best of the best and can be recreated in your kitchen with readily accessible ingredients. Plus, there is practical, proven tips, storage charts, how-to photo's, and at-a-glance prep and cook times. I love the pictures of the best recipes in each section - I am such a visual learner! If you are looking for the greatest and most comprehensive collection of recipes from many generations, then you have got to add the Taste of Home Best Loved Recipes cookbook to your collection today! Buy It: You can purchase Taste of Home Best Loved Recipes from now until September 13th only through the Taste of Home website. And keep in mind, when you order from the Taste of Home website, you'll get an exclusive Taste of Home Baking Guide Free and free shipping. Come September 13th, it will be released to the trade and will be available on Amazon, Barnes and Noble and where books are sold. 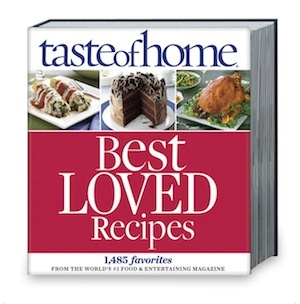 Win It: Taste of Home is generously offering (1) Taste of Home Best Loved Recipes cookbook to a lucky winner!